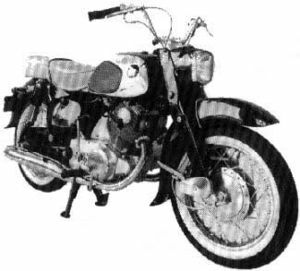 The Honda C77 or Dream 305 was a 305cc OHC 4-stroke street motorcycle manufactured by Honda from 1959 through 1969. 8 CA77 Dream Touring 305 "Early"
9 CA77 Dream Touring 305 "Late"
The Dream 305 followed in the footsteps of the Honda C100 Super Cub and was also enjoying healthy sales by the mid 1960s. Like the Honda Super Cub, it was light and easy to handle. Its 305 cc overhead-cam twin-cylinder engine gave the bike a top speed of almost 160 km/h (100 mph). It could be dressed up with saddlebags, luggage racks, and a windshield to increase its usefulness both as a commuter and a touring bike. 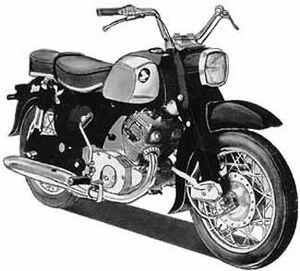 Production lasted ten years when it was replaced by larger models like the CB450 and later by the 750 Four. The reaction of the rest of the cycling manufacturers toward the Super Cub and the Dream should have been one of alarm. Instead, they thought of Honda as just another scooter company. The Honda Dream Touring 300 C76 was sold in 1959-60. Four colors were available: White, Black, Blue, and Scarlet Red. The handlebars were low-rise, pressed steel and painted. The fuel tank is one of the four basic colors with a solid chrome plate, but no rubber knee pad. It had a square headlight with an integrated speedometer. The engine was a 305cc 4-stroke OHC dry sump parallel twin with a single carburetor. The transmission was a 4-speed. The serial number began C76-100001. The CA76 Dream Touring 300 was sold from 1959-1960 in one of four colors: White, Black, Blue, or Scarlet Red. The bike differed from the C76 in that now it had hi-rise tubular chrome handlebars. 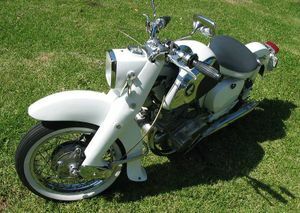 The gas tank was the basic color (white, black, blue, or red) with a solid chrome side panel. The headlight was square with an integrated speedometer. The engine was a 305cc OHC dry sump parallel twin with a single carburetor and the transmission was a 4-speed. The serial number began CA76-100001. 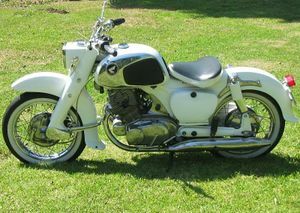 The CS76 Dream Sport 300 was sold in 1960 in one of four colors: White, Black, Blue, or Scarlet Red. 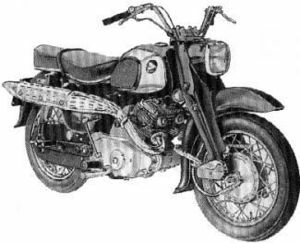 It had low-rise pressed steel painted handlebars like the C76, but the two chrome exhaust pipes (one on each side) were upswept like the later scramblers. The gas tank had chrome panels with black rubber knee pads. The engine was a 305cc OHC dry sump parallel twin with a single carburetor and the transmission was a 4-speed. The serial number began CS76-100001. 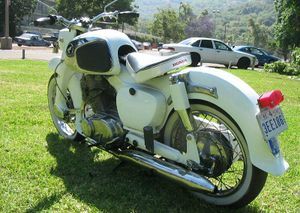 The CSA76 Dream Sport 300 was also sold in 1960 in one of four colors: White, Black, Blue, or Scarlet Red. Like the CA76 it had hi-rise tubular chrome handlebars. Like the CS76, the two chrome exhaust pipes (one on each side) was upswept. The gas tank had chrome panels with black rubber knee pads. The engine was a 305cc OHC dry sump parallel twin with a single carburetor and the transmission was a 4-speed. The serial number began CSA76-100001. 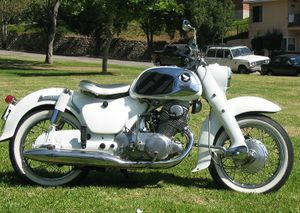 The C77 Dream Touring 305 was sold from 1961 to 1964 in one of four colors: White, Black, Blue, or Scarlet Red. The painted handlebars were low-rise pressed steel. The headlight was square with in integrated speedometer. There was a tire pump below the seat. 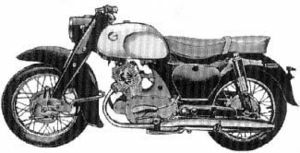 The engine was a 305cc OHC wet sump parallel twin with a single carburetor and the transmission was a 4-speed. The serial number began C77-100001. CA77 Dream Touring 305 "Early"
The CA77 Dream Touring 305 "Early" model was sold from 1960 to 1963 in one of four colors: White, Black, Blue, or Scarlet Red. The gas tank shape was the same as the C76 with rubber knee pads. The gas tank was larger than the early CA72. The headlight was square with an integrated speedometer. 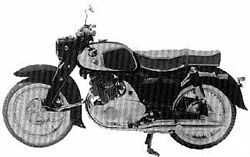 The engine was a 305cc OHC wet sump parallel twin with a single carburetor and the transmission was a 4-speed. The serial number began CA77-100001. CA77 Dream Touring 305 "Late"
The CA77 Dream Touring 305 "Late" model was sold from 1963 to 1969 in one of four colors: White, Black, Blue, or Scarlet Red. The gas tank shape changed but was otherwise like the "Early" model. The headlight was square with an integrated speedometer. The engine was a 305cc OHC wet sump parallel twin with a single carburetor and the transmission was a 4-speed. The serial number began CA77-100001. The CSA77 Dream Sport 305 was sold from 1960 to 1963 in one of four colors: White, Black, Blue, or Scarlet Red. It had the same body and chassis as the CSA76. 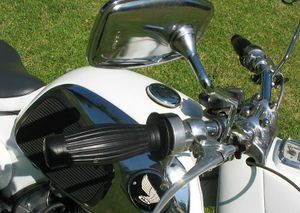 It had hi-rise tubular chrome handlebars as well as two upswept chrome exhaust pipes (one on each side). The gas tank had chrome panels with black rubber knee pads. 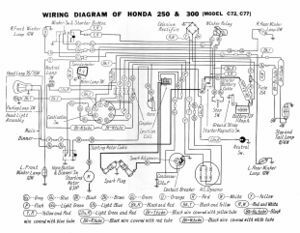 The engine was a 305cc OHC wet sump parallel twin with a single carburetor and the transmission was a 4-speed. The serial number began CSA77-100001. 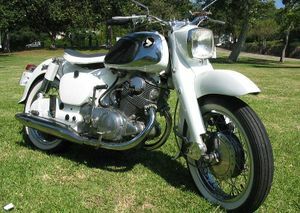 The CS77 Dream Sport 305 was sold from 1960 to 1963 in one of four colors: White, Black, Blue, or Scarlet Red. It had the same body and chassis as the CS76. It had low-rise pressed steel painted handlebars. 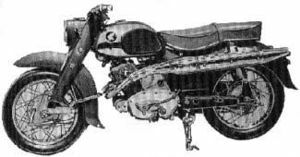 The two chrome exhaust pipes (one on each side) were upswept like the later scramblers. The gas tank had chrome panels with black rubber knee pads. The engine was a 305cc OHC wet sump parallel twin with a single carburetor and the transmission was a 4-speed. The serial number began CS77-100001. This page was last edited on 28 November 2010, at 20:48.